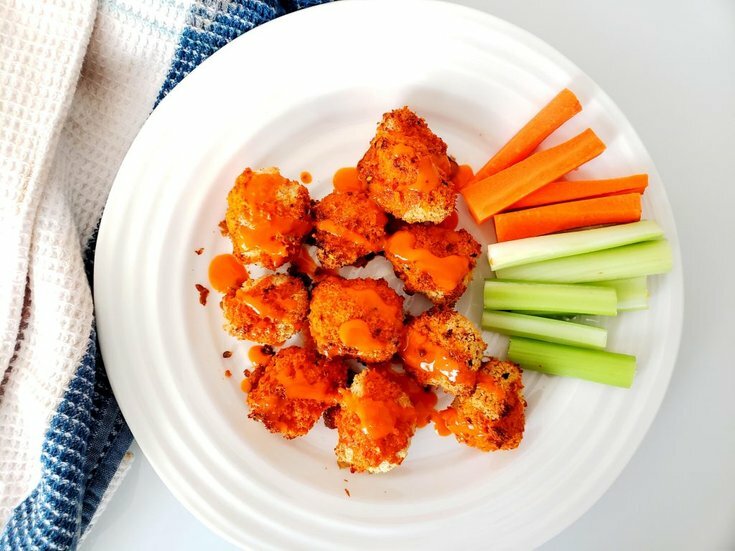 Get your buffalo wing fix with these baked buffalo cauliflower wings. The crispy, indulgent outside & tender middle is a foodgasm waiting to happen. Cauliflower has grown in popularity over the years, particularity for its versatility. It is also packed with nutrients, and since we aren't boiling or steaming the cauliflower all those nutrients are going to remain in every bite. Usually, vividly coloured fruits and vegetables tend to be the healthiest, but cauliflower is an exception. 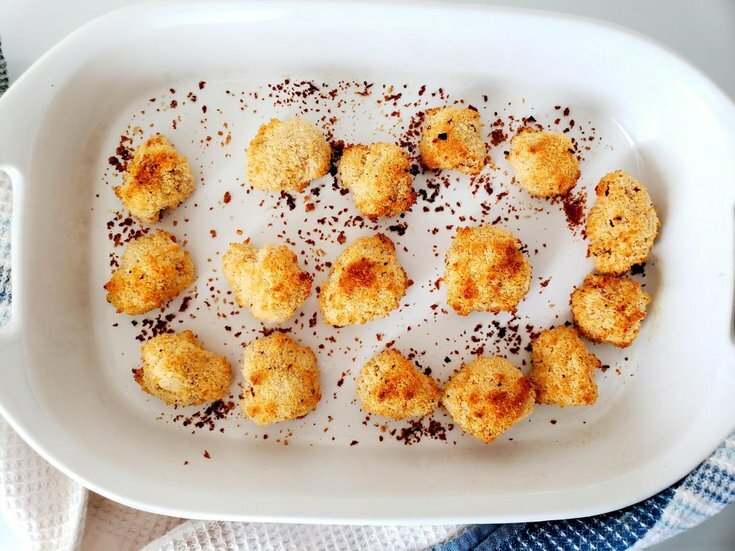 It is rich in vitamins, being a good source of vitamin C, folate, fibre, and vitamin K.
Start by preheating the oven to 400° F.
Then, cut the cauliflower into little bite-size florets. Also, make sure you cut the stems off and discard. Mix together the flour and cornstarch in a large mixing bowl, then add the almond milk and 2tbsp of buffalo sauce. 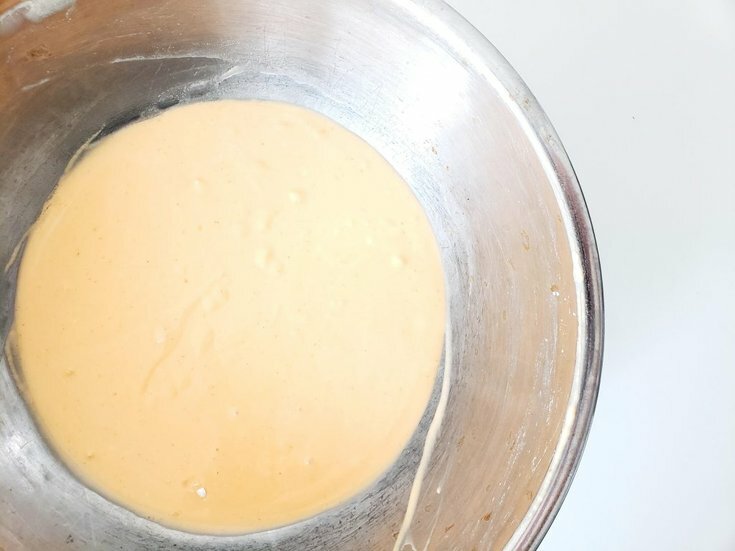 Mix until a thick but pourable batter is formed, similar to pancake batter. Set aside. In a separate bowl combine red pepper flakes and panko crumbs. Also, add a pinch of salt and pepper to the mixture. Then, set aside. Fun Fact that you may not know about panko crumbs (or at least I didn't), it is made from bread baked by electric current. This creates a bread without crust that is then ground to create fine silver crumbs. 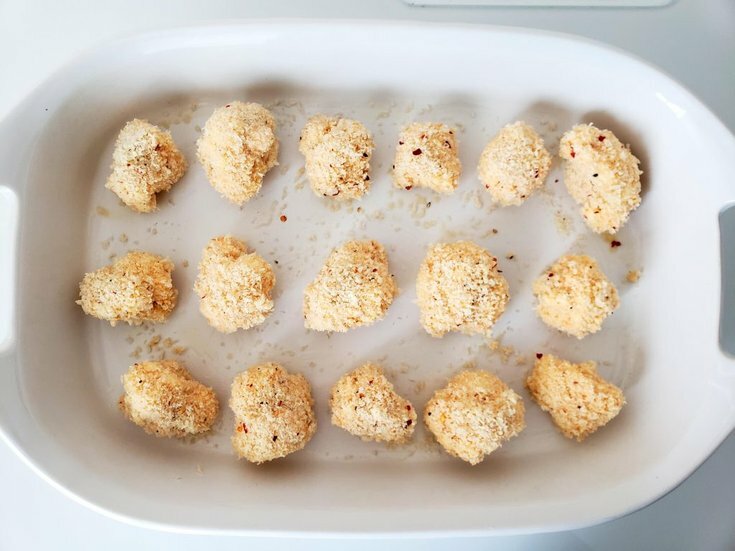 Though panko crumbs are mainly used in Japanese cuisine, they are growing in popularity for its crisper, airier texture. 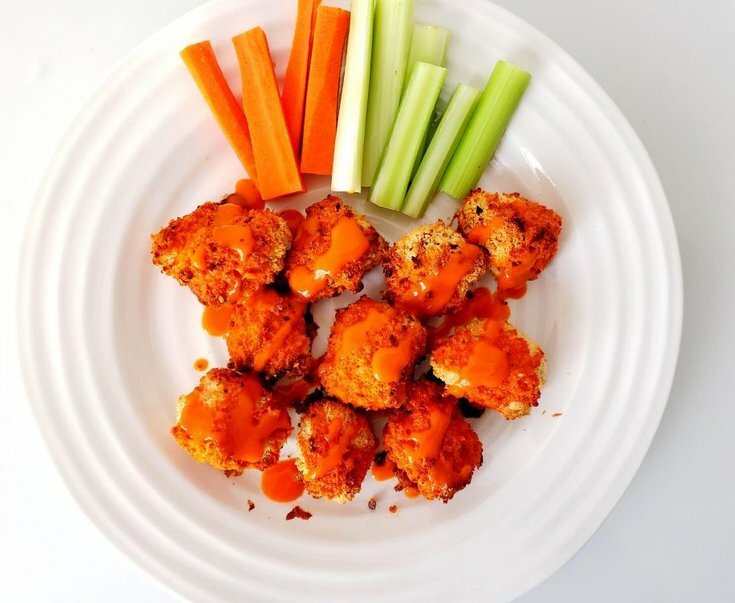 This makes panko crumbs perfect for this recipe, as they give the cauliflower wings a nice crispy outside without making them too heavy. Now, take each cauliflower floret and dip it into the almond milk batter, evenly coating each cauliflower piece. Then, transfer the cauliflower florets to the panko crumbs mixture, evenly coating each floret with a crunchy outside. Next, place the florets in a lightly-greased casserole dish, and cook for 40 minutes at 400° F.
Finally, remove from the oven and gently toss with buffalo sauce. you don't want the cauliflower wings to be drenched in sauce or they will be soggy, so just lightly coat them. Next, turn the heat to 450° F, then place the cauliflower wings back in the oven for an additional 12 minutes or until the outside becomes crispy again. Serve hot and enjoy as an appetizer, a snack, for lunch, or for dinner. Mix together the flour and cornstarch in a large mixing bowl. Then, add almond milk and 2 tbsp of buffalo sauce until a thick but pourable batter is formed, similar to pancake batter. Set aside. 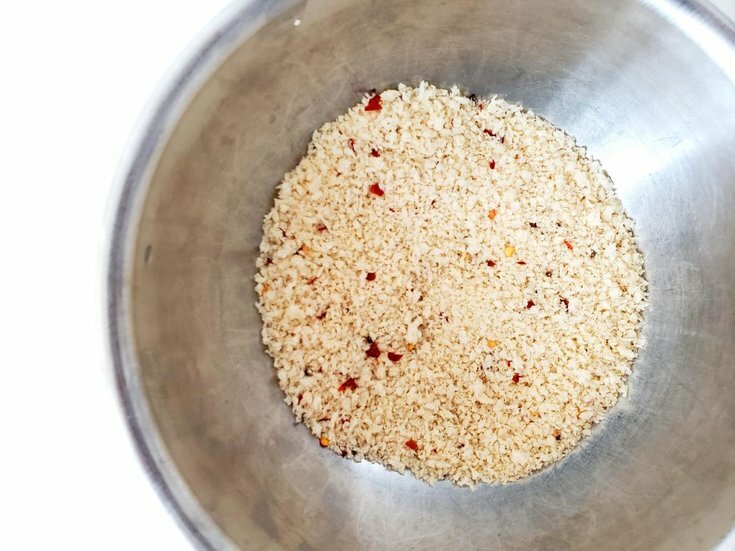 In a separate bowl combine red pepper flakes, panko crumbs, salt, and pepper. Set aside. Next, cut cauliflower into little bite-size florets. Take each cauliflower floret and dip it into the almond milk batter, evenly coating each cauliflower piece. Then, transfer the cauliflower over to the panko crumbs mixture, evenly coating each floret with a crunchy outside. Place the florets in a lightly-greased casserole dish, cook for 40 minutes at 400° F.
Finally, remove from the oven and gently toss with buffalo sauce. Next, turn the heat to 450° F, then place back in the oven for an additional 12 minutes or until the outside becomes crispy.